A population of Australian ants known as dinosaur ants, which supposedly have not changed in 40-60 million years, has been given national protection by the Australian Heritage Commission. The large ants live near a cemetery and another area south of the town of Poochera in South Australia. The honey-coloured insects, Northomyrmecia macrops, have distinctive lower jaws with very small teeth. The dinosaur ants are said by evolutionists to be similar to a species that lived 60 million years ago, and to belong to a group of ants found in 40 million year old Baltic amber. The Advertiser (Adelaide), May 31, 1995. As Dr Joachim Scheven and others continually highlight in Creation magazine, the scientific evidence points to ants ‘always being ants, and other major types of creatures’ always staying essentially the same also. There is no real evidence that these ants have evolved, or that the imagined millions of years are real. References in two scientific papers by Russian creation scientist Dr Dmitri Kouznetsov have been called into doubt. Geneticist Dan Larhammar, from Uppsala University in Sweden, tried to check sources cited in a 1989 Kouznetsov paper in the International Journal of Neuroscience. 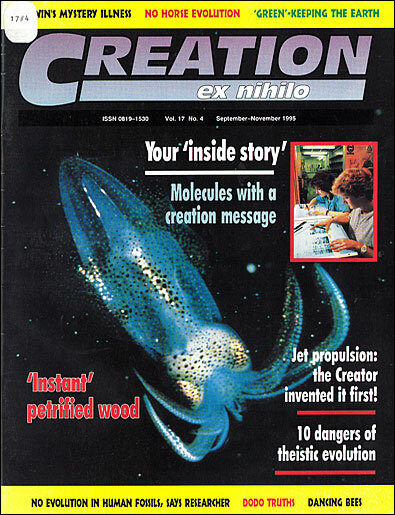 The paper was later published in a creationist journal with slight modifications. Larhammar, and other researchers since, could not verify the existence of a number of journals listed in Kouznetsov's references, despite worldwide checks of scientific and periodical reference directories. Creationist organizations which have promoted Dr Kouznetsov in the past, including Creation Science Foundation (publisher of Creation magazine), asked Dr Kouznetsov for an urgent response to this very serious charge. Despite repeated requests, he has failed to provide evidence that would clear him of these and other concerns. Creation Science Foundation obviously cannot condone any suggestion of wrongdoing (1 Thessalonians 5:22), and therefore has now dissociated itself from Dr Kouznetsov, pending satisfactory responses from him. An 8-year-old boy in West Yorkshire, England, has opened a small creation museum in a converted cattle truck 'to let people know the Bible is true and that evolution is a lie'. Samuel Tindall had a lot of fossils and other items which his family and friends had given him, and decided to put them to use as a Christian witness. 'When people say fossils and other things lived millions of years ago, they are taking away the reason Jesus died for us', Samuel said. He said his father let him have the cattle truck for his birthday to house his museum, and his mother and brother helped him clean it, paint it, and add a new door. As well as fossils, Samuel's museum has various types of rocks, toy dinosaurs, a tortoise, a model Noah's Ark, and 'hands-on' experiments in viscosity and sedimentology for his young friends. A Hawaiian bird is evolving a shorter bill, evolutionary researchers claim. They say that the iiwi (pronounced ee-EE-wee), a honey-eater with a long, down-curved bill, has changed its eating habits because its main food source, the lobelioid flower, has become rare. The iiwi's long bill is ideal for extracting nectar from the base of the deep corollas of lobelioids. But with the large-scale disappearance or extinction of several species of the flowers, the iiwi now feeds largely on the flowers of the ohia tree. Other honeyeaters that feed on ohia flowers have short bills, because these flowers lack corollas. Researchers who compared the size of living iiwis' bills with the bills of museum specimens collected before 1902 show that the length of the iiwi's bill has shortened 2-3 per cent. Other features have remained stable. Nature, Vol. 375, May 4, 1995 (p. 14). A hunting (non-returning) boomerang has been discovered in Poland, dated (by evolutionists) as being from the 'Stone Age' at around 20,000 years old. The weapon was carved from a mammoth's tusk, and was too precious to be thrown by archaeologists, who conducted tests using an exact replica made of plastic of the same density. The tests showed extremely stable flight characteristics, enabling accuracy even with minor air turbulence. Its form has been described as 'ingenious', and 'subtle details in carving of the ivory, all apparently designed to improve the boomerang's stability and ballistic qualities, indicate that its maker knew precisely what to do'. Nature Vol. 373, February 16, 1995 (p. 562). Finds such as this challenge the usual evolutionary assumption that the simple technology (stone, ivory) of so-called 'Stone Age’ deposits means that their users had less-evolved intelligence. Such people may have had access only to certain materials, or their society may have lost or abandoned the cultural 'know-how’ necessary to find and smelt metals, for example, of the pre-Babel society of Genesis 4:22. Ancient bees' nests in Arizona's Petrified Forest are baffling evolutionists. How, they ask, could the bees have survived for more than 100 million years before the evolution of the flowers they fertilize and depend on for nectar? Palaeobiologist Dr Stephen Hasiotis, from the US Geological Survey, discovered that fossilized logs in the Petrified Forest are riddled with holes which he believes are the nests of bees. The logs with the nests are dated at 220 million years old on the evolutionary time-scale, while the flowers that provide nectar for bees allegedly date from only half as long ago. Evolutionists are forced to conclude that either flowers appeared earlier, or the first bees did without flowers for a long time. Daily Telegraph (London), May 26, 1995 (p. 5). The Book of Genesis tells us that all life (including plants and animals) was created during Creation Week. Bees did not have to wait 100 million years, because these vast ages are only interpretations of the evidence, not facts. The reptiles were found around Xingyi city in Guizhou province. A researcher of ancient vertebrates from the Chinese Academy of Sciences, Zhao Xijin, said Guizhou was an important base for the 'dragons'. China's Guangming Daily newspaper said these 'dragons' were not the real ancestors of the dragons in Chinese mythology, they simply resembled Chinese dragons. The Times (Malta), May 25, 1995. Creationists have often proposed that dragon legends are based on real creatures. See for example: Russell Grigg, 'Dinosaurs and dragons: stamping on the legends’, Creation magazine (Vol.14 No.3 pp. 10-14). Australopithecus ramidus (named after the Afar word for 'root') made big headlines in 1994. Widely called 'The Missing Link', this fossil creature is given a more sober treatment in a recent Nature article. Discussing the difficulties, complexities, and changing opinion in this field, the author, Henry Gee, says that its present status as a hominid (human ancestor) is 'provisional'. Gee says it is 'possible that Australopithecus ramidus is neither an ancestor of humanity, nor of chimpanzees ...'. The article then (partly tongue-in-cheek) predicts that by the year 2000, 'Australopithecus ramidus will have been removed to a new genus'. Nature, Vol. 373, January 5, 1995 (p. 15). If you are one of those rare people who have perfect pitch, you will be able to identify any musical note without comparing it to a reference note. Like language, perfect pitch is believed to be unique to humans. As language is chiefly a left-brain function, a group of researchers decided to find out if perfect pitch was also a feature of the left side of the brain. Using magnetic resonance imaging, they compared the planum temporale regions in the brains of 30 musicians (11 with perfect pitch, 19 without) and 30 non-musicians. They found that the left planum temporale region was larger than the right for both musicians and non-musicians, but in the musicians the asymmetry was twice as great. The musicians who had perfect pitch were the most asymmetric of all. Science, Vol. 267, 1995 (pp. 616, 699).